The art world has always seen its share of power couples, but often the biggest question raised by such intimate alliances goes unanswered or even unasked: Taken together, who are we? In this fun and dynamic group show, which features four Santa Barbara couples who make art, that question gets four interesting answers. Virginia McCracken and Philip Koplin, Sandra Liddell Reese and Harry Reese, Penny Mast McCall and Wayne McCall, and Nathan Hayden and Hannah Rose Vainstein are the eight troublemakers, and Nancy Gifford, who curated the first of these Double Trouble shows last spring, is once again in charge of the selection and arrangement. The show was not necessarily organized to showcase collaboration, and each of these eight artists has a strong individual practice, but the end result implies that there’s no way to avoid some creative overlap within the context of an intimate relationship. 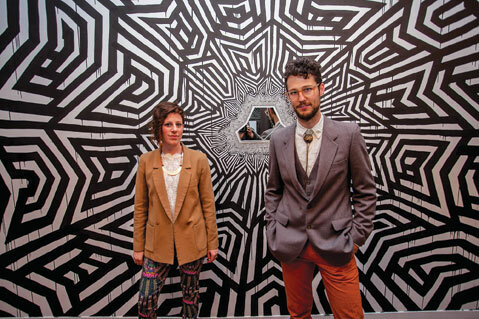 Nathan Hayden and Hannah Rose Vainstein embrace the concept of collaboration with an amazing wall piece titled “our powers combined.” Emanating outward from a central geometric construction of inset mirrors by Vainstein, Hayden has drawn an edgy, surreal, and borderline psychedelic design in black-and-white that begins tiny and gradually becomes bolder and broader. The innermost ring of marks was made with special brushes and took Hayden many hours on-site to complete. From there the process went more quickly, until the entire wall was covered. Through this clever use of scale and site, “our powers combined” delivers a fascinating metaphor for the creative relationship, with thousands of painstaking early gestures eventually bursting into a bigger, more public image of collaborative energy. Harry Reese continues his exploration of color, surface, finish, flatness, and depth with several fine abstract paintings, including the luminous “Passing Ships,” the title of which may or may not contain an ironic encoded reference to the longevity of his marriage to Sandra Liddell Reese. Her work typically employs beautiful paper, and, as in “bucket of blue smoke,” her playful, elegant designs show a fine responsiveness to the potentials of negative space. Taken together, the Reeses radiate a cosmopolitan confidence in the validity of modernism and the studio craft that underpins its most cherished achievements not only in painting but also in printing and the genre of the artist’s book. Philip Koplin and Virginia McCracken typically operate on a different scale and in different media than Harry and Sandra Reese, but they look great alongside them, given as they are to flights of whimsy that take as their points of departure such modern masters as Joseph Cornell and Ed Moses. McCracken’s cigar-box dioramas get cute descriptive titles like “Girl in Orange Skirt, Boy in Pink Hat” and “Me and My Monkey,” but, like her husband’s memorable drawings of mice and bears, these tiny figures seem to inhabit a world that’s on the verge of abjection and existential despair rather than adjacent to a commercial theme park. Wayne McCall and Penny Mast McCall work on opposite sides of the materials spectrum — he’s a photographer, and she works in fiber — but in this show they find a way to meet in the middle. Her grid of fiber squares, each of them a colorful independent composition, seems to wink at such canonical grid compositions as David Hockney’s Polaroid collages, while his series of “Contours” photos finds a sneaky way to smuggle woven, distressed wool into the gallery through topography. Each of these three images begins with a large-format photo of some rumpled, torn cloth and then overlays, presumably in Photoshop, the lines and numbers of a topographic map. There are even topo lines on the heads of the tiny nails that hold these pieces to the wall. It’s one of the strangest, most intuitive juxtapositions you’ll see this season, and another reason to check out Double Trouble Redux.